Most newer bicycles use cartridge bottom brackets, which are modular assemblies. These are normally not adjustable or serviceable; rather, they are intended to be replaced as a unit when the bearings become worn out or contaminated. An old-style cup-and-cone bottom bracket. The lockring wrench is about to loosen the lockring, the pin wrench is engaging two of the holes in the adjustable cup. (Some cartridge bearings do use these same tools.) Another article gives instructions on servicing cup-and-cone bottom brackets. 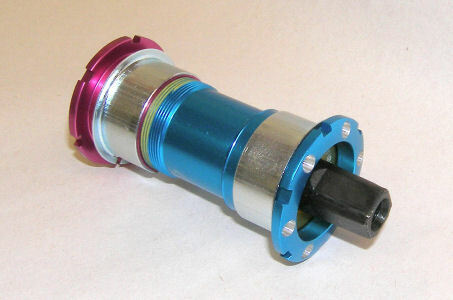 A cartridge bottom bracket. The splined tool is shown above the bottom bracket. The crank would need to be removed to actually use the tool. This article deals with cartridge bottom brackets, and will provide advice on a number of different brands and models. Cartridge bottom brackets are much cleaner and easier to work on than cup-and-cone bottom brackets -- grease and bearing balls are entirely enclosed inside the sealed cartridge(s). 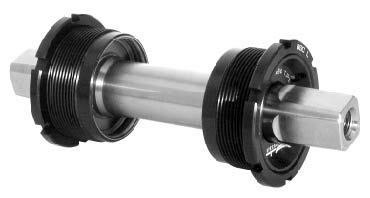 Our first, guiding example is a Phil Wood bottom bracket. Phil Wood was the first brand of cartridge bottom bracket, in 1971. It is more expensive than most others, but also has a very long service life -- and the bearings are replaceable at any well-equipped bicycle shop. Unlike most other brands, Phil Wood offers chainline adjustability. Installation is a bit more complicated for this reason. Phil Wood offers options to fit frames with newer outboard-bearing bottom brackets and all common threadings -- British/ISO, but also the older Italian, French, Swiss, Raleigh and Chater Lea threadings. (I've never even seen that one!) Phil Wood also offers a large variety of axles of different lengths to fit square-taper and splined cranks. Some of the instructions for Phil Wood bottom brackets below are helpful for other brands and models as well. This information is a supplement to the instructions on the Phil Wood site. Two mounting rings, which screw into the frame on each side and hold the cartridge in place. See Sheldon's bottom-bracket crib sheet for information on dimensions and see the selection at Harris Cyclery for details of axle lengths. Chainline can further be adjusted during installation by repositioning the mounting rings. The Phil Wood axle is shoulderless -- press-fit into the bearing cartridges -- and so its offset can be adjusted when the bearings are replaced. If you are not sure of the threading of the bottom bracket shell, measure it with a thread-pitch gauge or by trying to thread in bottom-bracket cups or mounting rings with known threading. The correct size will start and turn easily. Do not try to force a fit, or you will damage the threading. The right-side of British and Raleigh bottom brackets is threaded counterclockwise. 65 mm 2 9/16" 72 mm 2 13/16"
60 mm 2 3/8" 67 mm 2 5/8"
57 mm 2 1/4" 64 mm 2 1/2"
The cartridges in the image below are, from top to bottom, a Phil Wood cartridge for a 73 mm bottom-bracket shell; newer and older Phil Wood cartridges for a 68 mm shell (also now listed as for a 73-mm shell); and a Shimano UN72 cartridge. The right-side bearing faces are aligned; the difference in length at the left end of the cartridges is clear. If you use a cartridge which is too narrow for the bottom-bracket shell,, the mounting rings may go in too far and run up onto partially-cut threads inside the bottom-bracket shell. The mounting rings may bind and not engage the cartridge fully, or the threads may compress the mounting rings and cartridge, resulting in difficult installation and accelerated bearing wear. As of this writing (August, 2013), only a few of the longer Phil Wood cartridges remain in stock. While the shorter cartridge will work with a 73 mm bottom-bracket shell, it is marginal with a 76 mm Raleigh Twenty bottom-bracket shell. See our article about Raleigh compatibility for details. You can test whether a bottom bracket cartridge will work by threading in the mounting rings without the cartridge, until they begin to get hard to turn. (Make sure that the threads in the bottom-bracket shell are clean, because dirty or corroded threads can make the mounting rings hard to turn before reaching the end of the threads). The width between the outer faces of the mounting rings must be less than the dimension given in the table above. The mounting rings will thread in past the outer ends of the bicycle's bottom bracket shell, so measure the shell width and subtract the inset to the face of the mounting ring at both ends. Bear in mind that the chainline will only be adjustable within the limits set by the depth of the threading, and by sufficient engagement of both mounting rings. To avoid corrosion, different bottom-bracket shell materials require different mounting-ring materials, as indicated on the Harris Cyclery bottom-bracket page..
Phil Wood has special, wider mounting ring and lockring for use with a Shimano E-type front derailer, which attaches with a ring clamped under the flange of a right-side bottom bracket cup. Phil Wood makes a pro mounting-ring tool, with a handle, and a portable/consumer tool. Park Tool makes an even fancier tool for Phil Wood mounting rings. Phil Wood instructions recommend using two pro tools so you can easily turn both mounting rings at the same time. Still, one portable/consumer tool will do the job. You need a 22 mm wrench (or a 7/8 inch wrench, which is very slightly larger), or a large adjustable wrench to turn the portable/consumer tool. Unless your bicycle's cranks have extractor crankbolts, you also may need a crank remover, even for a new installation. You may need a rubber mallet to tap a mounting-ring tool into engagement, or to dislodge a mounting ring, and a hand-held grinder to remove projections inside the frame. To remove a Phil Wood bottom bracket for replacement or to readjust the chainline, first remove the cranks (cotterless or cottered), then unscrew one mounting ring. You may have to tap the mounting ring tool into place with a mallet, especially if the splines of the mounting ring are corroded. Pad the tool with the jaws of your large adjustable wrench or an old bearing cup so the the mallet will not strike the end of the axle. If the cartridge comes partway out, but won't slip out the rest of the way, the thicker part at one end is caught on something inside the bottom bracket shell. Usually, this is the screw that holds a cable guide in place under the bottom bracket, so remove that. After removing one mounting ring, the other will usually remain attached to the cartridge. You can usually pry it off easily with a flat-blade screwdriver. If that doesn't work, remove the other mounting ring that is still inside the bottom bracket, then thread the cartridge with its attached mounting ring into the frame. Attach a crank to the opposite end of the axle and wiggle it around to loosen the cartridge from the mounting ring. Then, if necessary, tap lightly on the end of the axle to push the cartridge out of the mounting ring . Newer Phil Wood cartridges have a rather thick aluminum outer sleeve. Check that the cartridge will slip through the bottom-bracket shell. Remove any bolt that protrudes inside the bottom-bracket shell. If necessary, use a handheld grinder such as a Dremel tool to remove obstructions. A half-round file is a distant second best, much slower. Steel welding material may be as hard as the file. It is difficult to avoid filing the threading. Before installing the mounting rings, the threading inside the frame must be clean. You may need to scrape old threadlock compound out with a tap or thread gauge. Clean the threads thoroughly with solvent and let them dry. Once the frame is prepared, run a trial installation to check the threading, the chainline, and that the cranks and inner chainring clear the chainstays. At this stage, do not yet use threadlock compound to secure the mounting rings. Phil Wood bottom brackets allow chainline adjustment by unscrewing one mounting ring and screwing in the other one. You do not need to tighten square-taper cranks down all the way; but do allow a couple of mm for when you will. Insert the cartridge so the "Phil" label in the middle reads correctly from riding position on the bicycle. Get both mounting rings started by hand, then tighten them down. With all modern frames, and with older English-, Raleigh- and Swiss-threaded frames, the right-hand mounting ring is left-threaded -- so you can easily tighten one mounting ring at a time. As that mounting ring tries to turn the cartridge, it will tighten the opposite mounting ring, which is threaded the opposite way. You can adjust the chainline by using the tool alternately on one side and then the other. With French and Italian threaded frames, both sides are right-threaded, and tightening one mounting ring may tend to unscrew the other. The entire assembly will then migrate toward the other side of the bicycle, and one or both mounting rings may not slide all the way onto the end of the cartridge. You may have to make an allowance for this in checking the fit. A small tube of threadlock compound is supplied with a Phil Wood bottom bracket, or you may use (blue) Loctite 242. With a right-and-left-threaded frame, or if you have two tools, spread threadlock compound on the threads of both mounting rings and place a couple of drops on the threads inside the frame, too. You usually will only need to use half the threadlock compound which Phil Wood supplies. You will then have enough remaining for reinstallation if that is necessary. If the frame is right-threaded on both sides and you can't get both mounting rings to engage the cartridge fully, reinsert the right-hand mounting ring, this time with threadlock compound, and let it cure. Threadlock compound hardens when no longer exposed to air. That may take a few hours. Then install the left-hand mounting ring. Finally, install the cranks and check alignment again. Unless you have allowed the threadlock compound on one side to cure, you can easily readjust the chainline now. Blue threadlock compound still allows the parts to be unthreaded in case you ever need to readjust the chainline or remove the assembly. Several other manufacturers beside Phil Wood make cartridge bottom brackets, see selection at Harris Cyclery. with press-on cups on both ends. threadless, with internal-expanding clamp rings, for a frame with damaged threads (or nonstandard threading). with outboard bearing assemblies for use with large-diameter hollow axles (including Phil Wood, for nonstandard threading)..
Press-fit, with outboard bearing assemblies. I can't cover installation of all of these in detail here, but I can describe them well enough to help you choose the right one. Park Tool provides good general instructions on removal and installation of the more common types, and instructions are supplied with each new bottom bracket. Links to additional information accompany the descriptions of the different types, below. None use the same tool as Phil Wood, though some are very similar and look as though they should work. Harris Cyclery carries tools -- see the selection online. Older SunTour cartridge bottom brackets use the Park FR-6 tool which is made to fit SunTour 4-notch BMX freewheels. Harris Cyclery also sells this tool: see this page. fits this old SunTour bottom bracket with 8 notches. Thanks to Cory Heintz for the information. Many cartridges are thinner in the middle than at the ends, so a cable guide attachment screw protruding into the bottom bracket shell my keep a cartridge from slipping out of the bottom bracket. solution: remove the screw. Phil Wood bottom brackets have a press-on mounting ring on each side. Other brands use a flanged cup on one side, so the chainline is not adjustable other than by adding a washer under the flange. The IRD Quad QB-75 and QB-55 bottom brackets are a good solution for an older, square-taper crank. The Sugino BB-105/BB-7420 is similar and is available with a short axle suitable for a single-speed bicycle. Velo Orange makes bottom brackets of this type to fit French and Italian threading, as well as British/ISO. 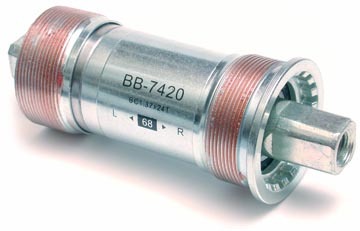 The oldest kind of Shimano cartridge bottom bracket, the BB-UN72, was very similar to a Phil Wood bottom bracket, and could be installed using Phil Wood mounting rings and tools. (Shimano mounting rings, on the other hand, extend too far over the cartridge to be compatible with a Phil Wood bottom bracket, and install with different tools.) The UN72 is no longer made, though it may remain available as new old stock. The cartridge is slightly narrower than the Phil Wood 68 mm cartridge. Recent Shimano bottom brackets (include the UN-25, UN-52, UN-54 and UN-55 series) have no mounting ring on one side, but rather, one end of the cartridge threads directly into the frame. These bottom brackets are available only for current threading standards. The other cup may be a plastic part which can break if overtightened; better replacement parts are available in the aftermarket -- see selection at Harris Cyclery. SKF bottom-brackets are of high quality and are of this type. They are especially suitable for tandems and heavy riders. The trade-off is that they are heavier than many other cartridge bottom brackets. These may allow limited chainline adjustment. TA makes bottom brackets of this type which have a sealed cartridge bearing in a cup at each end, and no full-width cartridge. Precise alignment of the faces and threads of the bottom-bracket shell is necessary. 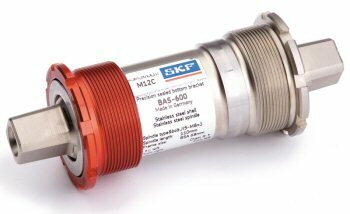 These bottom brackets are available with British/ISO and Italian threading. The radial-contact bearings of the TA bottom bracket should be adjusted to allow a tiny bit of play so the bearing balls ride in the bottom of the raceways, avoiding accelerated wear. Velo Orange sells a clever cartridge bottom bracket with expanding sleeves that press against the inside of a bottom bracket shell with damaged threads. This cartridge will work with all common threading standards except Italian, whose threads have a larger diameter than the others. A shim of 0.5 mm or .020 inch steel will probably adapt this cartridge to with an Italian shell. The bottom-bracket shell should be between 68 and 71 mm wide. Some Raleigh bicycles and mountain bikes have a wider bottom bracket shell; the expanders unfortunately can't be extended far enough apart to work with these. 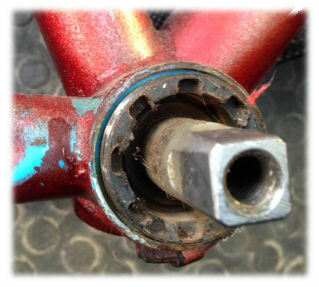 Some bottom brackets use no full-width cartridges, because the bearings are press-fit directly into the bicycle frame. This approach was never very common -- there is the risk that repeated installation and removal may enlarge the bearing seats in the frame, loosening the fit. On the other hand, dimensions of sealed bearings are well-standardized, so it is possible to purchase replacement sealed bearing units from any good bearing supplier. Any good machine shop can press bearings in and out of a frame. Klein used special tools to service press-fit bearings. There is a photo essay on extracting a Klein bottom bracket here. Phil Wood makes an outboard bearing assembly (see next item in this list) which presses in where the inboard Klein bearings went and avoids further wear to the frame. Merlin information also is online (look at bottom of page). Also see BB30 information and information from Park Tool on several varieties of bottom brackets. Our unthreaded bottom bracket cribsheet gives dimensions and compatibility information for most of these bottom brackets. These are common with newer cranks, and thread into the frame same as other bottom brackets, only the bearings are outside the ends of the bottom bracket shell, making it possible to use a large-diameter hollow axle for greater stiffness and lighter weight. Park Tool has good instructions online for this complicated and finicky bottom-bracket installation. The alignment of the threads is critical, as the bearings at the right and left sides are not aligned to each other by a cartridge. Phil Wood sells outboard-bearing assemblies that fit every bottom-bracket threading and Klein press-in bottom brackets, making it possible to retrofit outboard-bearing cranks onto an older frame. Different manufacturers use different spline patterns to fit the crank to the axle. Phil Wood bottom brackets work with Shimano cranks and others that have the same dimensions, though not all that use outboard bearings and in particular, not Campagnolo. Though the Phil Wood assembly is sold in the Raleigh 26 TPI threading, it probably will not work with the long (76mm) bottom bracket shell of the Raleigh Twenty, Tourist and Chopper. See information on the Phil Wood site. These tighten into the frame without using the frame threads, and avoid the finicky alignment issues with other outboard bearing assemblies. The Pressfit 30 (PF30) design (with a 30 mm axle) is a relatively new development as of 2010, from Truvativ (SRAM). Abandoning threading and using a larger (46 mm) bottom-bracket shell make for better compatibility with carbon-fiber frames. This bottom bracket is covered on our unthreaded bottom bracket cribsheet.